Countryside Camp and Conference Centre serves as the retreat facility of choice to over 4000 guests from September to June each year. Understanding your needs as a retreat coordinator when it comes to food service is just one of our major strengths. We offer you the choice of Self-Catering or In-House Catering for your retreat. The self-catering option is available to guest groups whose culinary tastes are more cultural than our traditional Canadian menued items. Each of the three lodges available at Countryside Camp have fully equipped, Board of Health inspected, commercial kitchens: stainless steel work surfaces, knives and cookware, flat ware and serving utensils, coffee makers, automatic dishwashers, refrigerators, freezers, stoves and ovens. All this and at no extra charge for your retreat! The Food Service Staff at Countryside Camp and Conference Centre works diligently to provide all our guest groups with the best in food quality and quantity. 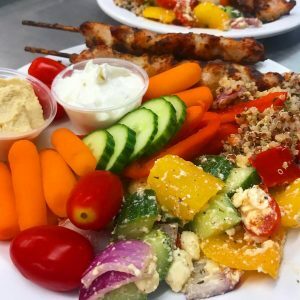 Jody Godwaldt, Mama Jo as she is known around here, has created a nutritionally balanced menu for retreats that will surpass any of your old ‘Camp Food’ memories and will leave you wanting to come back for more. The mix of organics and homemade items serve as a benchmark to the level of quality you will come to appreciate and expect when being served by her staff. Just the smell of the homemade brownies baking and the anticipation of that first chewy bite will…. Sorry, I was off in brownie dreamland. You will understand what I mean should you choose this option and it is available. We are pleased to present you with a variety of meal options through our catering services and encourage you to contact us regarding your group’s food needs. Below is an example of food choices available. * Coffee and Tea are available at all meals; Water, Juices and/or punch served at each meal. Your group is responsible for table & chair setup and setting up tableware. Breakfast 8:15 a.m.; Lunch 12:30 p.m.; Dinner 5:30 p.m.
Snacks are also available to order; price per person as marked below. Afternoon 3:00 p.m.; Evening 8:30 p.m.
*Please notify the Foodservice Staff at least 1 week prior to your stay regarding any dietary concerns or allergies.